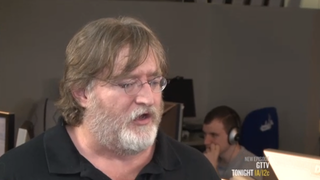 In an interview with GameTrailers TV that will air tonight, Valve head Gabe Newell elaborates a little bit on his distaste for Windows 8. Here's the video, in which Newell says he hopes he's wrong about Windows 8 being a "catastrophe," because if he's wrong, the company will wind up making a lot more money. But right now, he thinks Windows 8 makes things a lot more complicated than they need to be. More of Newell's interview will be up on GTTV tonight.